We are proud to introduce one of the world‘s best practices in eco-tourism to our national and international desert lovers (Matin Abad Camp) . After two years of research we decided to 14 design a location in the Iranian desert so our guests can experience a peaceful full-star nights after a fun camel back riding and a walk on the hot sands of the desert during the day. And we decided to do this task as best as possible by following all environmental and industrial requirements. The Matin Abad eco-camp and organic farm is located 60 km from the city of Kashan one of the tourism attractions in central Iran. The eco-camp is in the heart of an Iranian desert one side facing the highest central Karkas Mountains and the other side facing the Dasht-e Kvir Desert and salt lake. 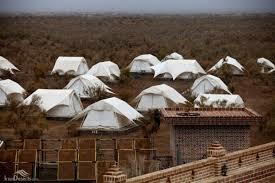 In this eco camp our guests .